With Les Bleus still reeling from the debacle that occurred at the World Cup in South Africa, the French basketball team is doing its best to bring some much needed amour and dignite back to the country. Through the first three games at the 2010 FIBA World Championship in Turkey, France is in first place with a perfect 3-0 record, including a stunning opening-day victory over heavily favored Spain. More surprisingly, France is doing all this with its so-called “B” team. With Tony Parker, Joakim Noah and Mickael Pietrus – arguably Les Bleus’ three best players – sitting out the World Championships and Boris Diaw looking overweight and out of shape (again! ), France wasn’t considered contenders and expectations were low after getting destroyed by the United States during the Nike World Basketball Festival in New York. But one game changed the entire outlook of the team. In Saturday’s opener against defending world champ Spain, France pulled a 72-66 upset thanks to outstanding performances by Nicolas Batum (14), Alain Koffi (11), Mickael Gelabale (16) and Andrew Albicy (13). Batum, who plays forward for the Portland Trail Blazers, has been France’s best player at the World Championship. He almost single-handedly lifted France to victory over Canada, 68-63, on Tuesday, scoring 24 points and grabbing seven rebounds. Batum was at his best during crunch time, as 17 of his points came in the second half. Canada’s Levon Kendall – who missed two wide open 3-pointers to tie the game deep in the fourth – finished with 15 points, while teenage sensation Kelly Olynyk finished with 13 points on 4-for-5 shooting. The guard play has been a pleasant surprise for France, which was thought to be the team’s weakness without Parker. But point guards Yannick Bokolo and Andrew Albicy have been solid, and shooting guard Gelabale has played well on both ends. Bokolo, who plays for French club Gravelines Dunkerque, is a 6-foot-3 physical guard who, unlike Parker, is not a liability on defense. Albicy (5-10) doesn’t have a lot of size, but he brings a nice change of pace from Bokolo. Gelabale played three seasons with the Seattle SuperSonics before returning to Cholet. And even though Diaw looks like he’s been hanging out at In-N-Out Burger too many times this offseason, the Charlotte Bobcats’ forward has been a big player on offense, mainly with his passing. 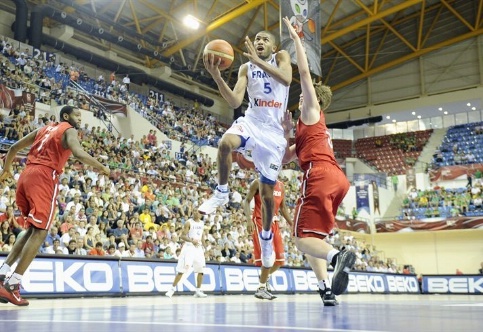 Against Canada, Diaw had eight points, six rebounds and five assists. Koffi and Ian Mahinmi have done a decent job in the middle. Koffi is averaging 11 points and five rebounds, while Mahinmi – who was traded to the Dallas Mavericks – is averaging seven points and four rebounds. France is probably not going to win the gold medal in Turkey, but at least the basketball team is doing a lot better than the shamed soccer team.